The 18k Yellow Gold Diamond Spiral Link Tennis Bracelet you now have the option in bringing something unique in to the market, as well as your Jewelry Wardrobe. This intricate Diamond Tennis Bracelet gives off a radiant, but professional look from any angle that it’s observed at which makes it one of our most unique pieces in the market today! The shape and cut of diamond. There are many shapes when it comes to diamonds. The round brilliant cut diamond shape being the most popular due to it perfect cut and precision for brilliance and shine. This represents the length of the bracelet in inches, from one end to the other. The standard length which is commonly sold is 7" inches. 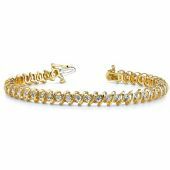 Wedding Bands Wholesale offers different lengths to suite your needs.